Peters is a 10-year veteran of the Grover Beach force. He will take over as chief on June 1 with a base salary of $124,800, or $10,400 a month. Current chief Jim Copsey retired late last year, but stayed on the job as interim chief at a rate of $11,071 a month. Copsey became eligible for his CalPERS pension when he retired, and California law allows him to collect both the salary and retirement pay for a period of six months. Mayor John Shoals expressed concern about Peters’ contract. In particular, Shoals questioned a clause that grants Peters nine month severance pay if the council fires him without cause, and he does not find another job. Still, Shoals voted in favor of the contract. The council approved the contract unanimously. City Manager Bob Perrault told the council that Peters stood out among a field of candidates from across the U.S.
Peters said his priorities as the new chief are foot patrols, a bicycle patrol and placing cameras in local parks. Long-term solutions to homeless and panhandling problems will come from greater regional cooperation, Peters said. The median Grover Beach income is 49,000, with most residents earning between 30-70k range. The median 2 bedroom rental is $1300, 3 bedroom $1698. Residents who own homes just got 100% fines on their water bills if they did not reduce their use from last year. It does not matter if the owner/user had already been conserving. They must pay a huge water bill, submit an application begging the City to approve a waiver to not charge the fines, and must prove conservation has/is occuring. The City can say no if they want, and then the fine can increase to up to 300% per month. Property taxes were imposed on the homeowners so that the 3rd world looking roads (the Police department and City Hall got nice new pavement) could be fixed. My point? Does it look like Grover Beach residents can afford to pay a Chief of Police a 9 month severance pay package, NO MATTER WHAT HE DOES????? He can punch a kitten and put it on Youtube and the City will still will pay him. I feel all better though, because Mayor Shoals DID feign some “concern” about that 9 months pay in the contract. It’s kind of like having a festering wound, and rather than taking care of and controlling the infection, you just say “oh well” and design a tattoo of an angry skull made to look like the pus is SUPPOSED to drain out of the mouth. It no longer SEEMS as icky, BECAUSE LOOK AT THAT AWESOME TATTOO. Ok, ok. Yes. it’s dramatic. But I wonder how many Grover Beach residents can do ANYTHING they want at their job and if they get fired, they take a 9 month VACAY!! Body cameras on a man who’s packing a pistol and a long gun is about as stupid as our armed forces not being able to buy a beer until they’re 21. Absolutely stupid thinking. And of course we all know what we will be hearing next from others cities, “Grover beach is giving 9 months severance so we must at least match so we can hire the best and brightest” and the evil cycle continues. 9 months severance pay. Lunacy. To prevent abuse, the troubled town of Oceano should have full time cameras on the chief, and also watching any reefs and shoals too. 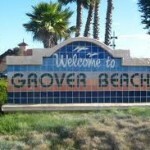 how many residents in grover beach make $125K a year? yet they all pay for this pathetic money chasing flea. So you would like to be the police chief then or are you simply complaining about something just to complain? Poor New chief agreed to just over 10k/mo. Dismal pay. He should have negotiated better. Maybe if he breaks the law then he can have a payout too. Gubment! Yes, six months severance pay wasn’t enough, but why stop at 9 months? Why not just pay him full salary for the rest of his life no matter why or when he leaves the position? oh yeah we already do that……..
Not saying that the priorities are bad, but if cameras can be put in the parks, cameras with audio can and should be put on the cops. I AM saying that the priorities are bad. Cameras on cops should be way above cameras in parks. In fact, I would like to see a public case made for the park cameras that is overwhelming since I don’t like the idea of government surveillance by camera without a specific purpose. At the very least, any video recorded from such cameras should be automatically wiped after 3 days if not used in evidence. Such videos should also not be available to anyone without a specific request (i.e. a court order). Why now just put them in all public spaces and fire all the Police and let the Judge/Jury review the tape recordings?